FEMA, in coordination with the Federal Communications Commission, will conduct a nationwide test of the Emergency Alert System (EAS) and Wireless Emergency Alerts (WEA) on Wednesday, Oct. 3, creating a cacophony of alarms and warning tones on cell phones, radios, and televisions from coast to coast. The WEA test is most likely to be heard… in every school, office, and store as nearly all wireless phones sound off starting at 2:18pm EDT. Two minutes later, radio and television stations, NOAA weather radios, and cable, satellite, and telco TV systems, will deliver EAS alerts to their respective audiences. This will be the first time FEMA and the FCC will deliver a nationwide WEA test, which will measure the effectiveness of using cell phones to mass deliver emergency alerts and action messages on a nationwide scale. Previous uses included urgent Amber Alerts and weather-related messages, but only to specific localities or regions. The government agencies want to know if America’s cell phone carriers can deliver messages to all of their customers accurately and on a timely basis. 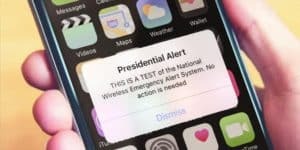 The emergency alert messages have no political connection to the Trump Administration or the White House, and were first envisioned during the Bush Administration. Despite that, some planned to mute their phones or switch them off as a protest against the president, falsely fearing he might use the system to deliver political messages.